" Our minds are perfectly developed for accepting chaotic input and creating meaningful packets of information from them. We extrapolate from whatever else our experience has told us and interpret according to what appears to fit and seems likely to work. We are wrong a huge amount of the time, but when it doesn't work then we iterate and learn. We keep developing new models until something works for us." It is becoming increasingly clear that many of our ailments are created by the rule of a corporate elite that suppresses other cultures and economic classes. The elite's tactics of mind manipulation are behind our alienation from Nature, which includes our self and our communities. Insofar as we can be coerced to be dependent on their products and income from jobs they offer, they profit royally from their power over us without exerting visible force. Indeed, they can make us believe we are their beneficiaries. Hah! Yet, it is increasingly clear that we can't blame these classes for our woes, for it is we that ultimately maintain their power. An abuser can only abuse as long as the abused does not create an alternative living situation for his self or her self. What is our educational system if not a system of control through indoctrination? The etymological ground of the term, education , means to unfold. The reader may rightly question, "Unfold What?!" "Potential" is what I would answer back. A person's potential in relationship to his or her community, which includes the rest of the planet, is his or her most valuable asset, to be protected, nurtured, and rewarded in all our cultural institutions. Education should be about drawing forth our own insights, talents, and creativity; not about stuffing our heads with the authority's version of history, economics, literacy, and competition. In essence education is a joke, for in modern day its purpose is indoctrination. Those students who can spit what they are force-fed back out undigested and unadulterated by their individual imaginations are the ones that will be rewarded with A's and high paying jobs within the corporate system. The creativity of our children, grandchildren and great grandchildren is infinite as is the potential of a new way of life for our species and the planet. Being infinite, both good and bad potentials abound. Yet, perhaps we have had enough of the evil and are now ready to co-create a planet filled with love and a sense of teamwork with all of its plants, animals and systems in creating a healthy place to live. Are we ready? Remember: the beginning of our unfolding potential is chaos! Change is not possible without it. Many of us run for the "cover" of the status-quo at this point. Who knows what monsters lurk among the possibilities in the great unknown? This is the great "gotcha" the powers-that-be have over us"until we come to terms with chaos. Heather Marsh describes the political ramifications of chaos beautifully in an interview she did with my wife and me on Envision This! She states that in current government and judicial systems, we really don't have a place to allow for chaotic systems. Indeed, our standards remain intransigently fixed. In my wording, "control freaks" run these systems. Chaotic systems scare them. This fear is driven by systems that have a more selfish reason (e.g., money, political power over others) to maintain the status quo. It is also a fear of self-annihilation. Chaos can take the ego into places where it feels as if it becomes non-existent. But, in fact, it just returns those egos to the realm of possibilities. Heather states we are able to deal with chaos in our institutions, to some degree. For example, a strict medical system based on corporate running of treatment (such as drugs and surgeries) may continue in prescribing numerous drugs and will maintain that conventional way of treatment. Yet, other treatments such as homeopathic medicine crop up that get us out of this pattern by providing alternatives. Chaos thus offers alternative ways of doing things. Try as they might, the gatekeepers cannot annihilate chaos, for it is the natural mother of all possibilities--including the one they are defending right now. Those grassroots just keep sprouting, no matter how much Agent Orange is poured on them. Change (including death and taxes) is the one inevitability. Heather is a political theorist as well as a human rights and Internet activist. 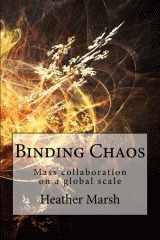 She is the author of Binding Chaos: A Study of Methods of Mass Collaboration . She is also past editor in chief and administrator of the Wikileaks news outlet, Wikileaks Central. She used the media attention on Wikileaks in 2010 to 2012 to shine light on human rights and transparency issues and support revolutions around the world.